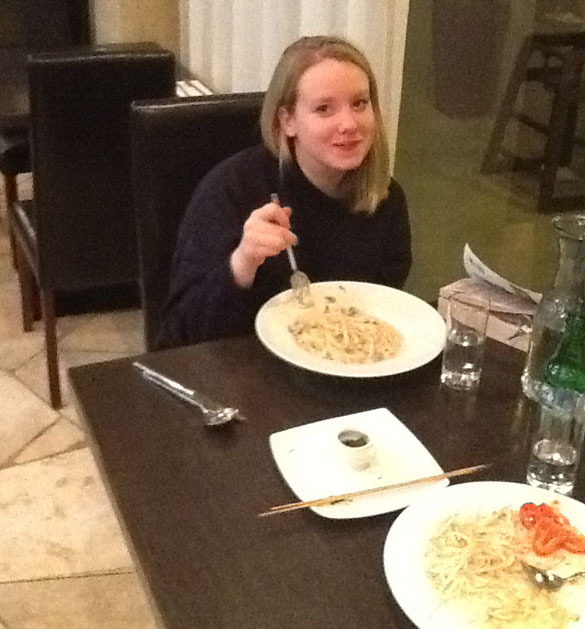 It’s a low-light, iPad photo, but at least it shows Wooster geology junior Melissa Torma enjoying a fine meal in the Hotel Ramon of Mitzpe Ramon, deep in the Negev of Israel. We arrived here this afternoon after a 22-hour journey from Ohio. The hardest part for me was enduring the 10.5-hour flight and then making a quick transition to driving through heavy Tel Aviv traffic on our southern journey. It all went well, though, and we are safely in our rooms getting ready for our first day of fieldwork tomorrow. Melissa and I are here to measure sections and collect specimens for her Senior Independent Study project involving the description and paleoecological analysis of a Jurassic brachiopod-crinoid community in the Matmor Formation of Hamakhtesh Hagadol. I’ve collected these crinoids before here, and now Bill Ausich of Ohio State University and I are describing them as a new species of Apiocrinites. Melissa and I want to find more specimens (we hope more complete specimens) of this crinoid and place them in the context of the entire marine community they inhabited. Our partner in this effort is again our friend Yoav Avni of the Geological Survey of Israel. When we left the USA yesterday there was a series of violent actions between terrorists in Gaza and the Israel Defense Forces. You may hear about rockets from Gaza striking southern Israel, but they are far from us. We see no evidence of the fighting here. We are very safe in the vastness of the Negev Highlands. Good luck with your fieldwork! I’m looking forward to your photos and stories.